People often bang on about the fashion/style wasteland of the 1970s, but I’d suggest that the mid-to-late 1980s were in fact one of the darkest times in Britain’s sartorial history. I remember, as a naive teenager, sporting the horrific combination of a pair of sand-coloured chinos*, a striped shirt and a reversible bomber jacket with one orange and one black side. This was beautifully topped off by some over-gelled hair, approximating some kind of Nick Kamen ‘do, but gone horrifically wrong. The holding of a Slinky by one band member: what is this supposed to mean? Is it wacky? Is it kooky? The expressions on the band members’ faces: in all but one instance, look deep into these faces and you’ll see boredom, uncomfortableness and a strange feeling of arrogant dumbness. *As an aside: ‘chinos’? Where did this bizarre, ridiculous name for a style of preppy, boring trouser actually come from? According to Wikipedia, the word refers to the type of cloth. But I’m not sure I buy that – the word seems forever tied to a light sand coloured loose-fitting trouser that painfully encapsulates the entire concept of ‘smart casual’. 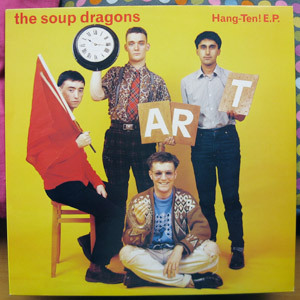 I picked up a great CD through Amazon a few years ago of those early Soup Dragons singles (including Hang Ten) perhaps I could sort you an MP3 bundle of those tracks? Thanks but I have all of the old singles and I’m not yet digital enough to listen to most music on anything except vinyl… You reminded me though of an old tape I’ve got somewhere with all of the first Soup Dragons and Primal Scream demos on – I’ll see if I can dig it out some time!